The Radon Specialist is a certified Radon Mitigation Contractor specializing in design and installation of high quality, effective radon reduction systems in North Carolina. Our radon systems are also effective in reducing the levels of Trichlorethylene (TCE)in both commercial and residential structures. We service the Winston Salem, Greensboro, Raleigh, Durham and Charlotte areas. We believe in quality and customer satisfaction, and these are our core values. With over 12 years experience in contract work, we have the knowledge and understanding of what works and what does not. If you have a TCE problem or would like to know more about the TCE levels in your business or home, call us first. We will help you safely solve the problem. 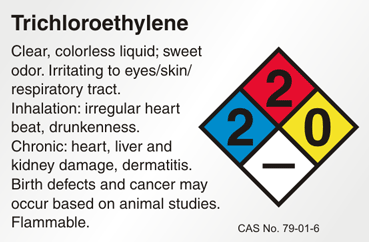 Trichloroethylene is a manufactured, volatile organic chemical. It has been used as a solvent to remove grease from metal. Trichloroethylene has also been used as a paint stripper, adhesive solvent, as an ingredient in paints and varnishes, and in the manufacture of other organic chemicals. Other names for trichloroethylene include TCE and trichloroethylene. TCE is a common name for trichloroethylene. TCE is a clear, colorless liquid, and has a somewhat sweet odor. It is non-flammable at room temperature and will evaporate into the air. How can I be exposed to TCE? People can be exposed to TCE in air, water and food. Exposure can also occur when TCE, or material containing TCE, gets on the skin. How can TCE enter and leave my body? If people breathe air containing TCE, some of the TCE is exhaled unchanged from the lungs and back into the air. Much of the TCE gets taken into the body through the lungs and is passed into the blood, which carries it to other parts of the body. The liver changes most of the TCE taken into the blood into other compounds, called breakdown products, which are excreted in the urine in a day or so. However, some of the TCE and its breakdown products can be stored in the fat or the liver, and it may take a few weeks for them to leave the body after exposure stops. What kinds of health effects are caused by exposure to TCE in air? In humans, long term exposure to workplace air containing high levels of TCE (generally greater than about 40,000 micrograms of TCE per cubic meter of air (mcg TCE/m3)) is linked to effects on the central nervous system (reduced scores on tests evaluating motor coordination, nausea, headaches, dizziness) and irritation of the mucous membranes. Exposure to higher levels (generally greater than 300,000 mcg TCE/m3) for short periods of time can irritate the eyes and respiratory tract, and can cause effects on the central nervous system, including dizziness, headache, sleepiness, nausea, confusion, blurred vision and fatigue. In laboratory animals, exposure to high levels of TCE has damaged the central nervous system, liver and kidneys, and adversely affected reproduction and development of offspring. Lifetime exposure to high levels of TCE has caused cancer in laboratory animals. Some studies of people exposed for long periods of time to high levels of TCE in workplace air, or elevated levels of TCE in drinking water, show an association between exposure to TCE and increased risks for certain types of cancer, including cancers of the kidney, liver and esophagus, and non-Hodgkin’s lymphoma. One study showed an association between elevated levels of TCE in drinking water and effects on fetal development. Other studies suggest an association between workplace TCE exposure and reproductive effects (alterations in sperm counts) in men. We do not know if the effects observed in these studies are due to TCE or some other possible factor (for example, exposure to other chemicals, smoking, alcohol consumption, socioeconomic status, lifestyle choices). Because all of these studies have limitations, they only suggest, but do not prove, that exposure to TCE can cause cancer in humans and can cause developmental and reproductive effects as well. What is the level of TCE that people can smell in the air? The reported odor threshold (the air concentration at which a chemical can be smelled) for TCE in air is about 540,000 mcg TCE/m3. At this level, most people would likely be able to start smelling TCE in air. However, odor thresholds vary from person to person. Some people may be able to detect TCE at levels lower than the reported odor threshold and some people may only detect it at concentrations higher than the reported odor threshold. If I can’t smell TCE in the air, am I being exposed? Just because you can’t smell TCE doesn’t mean there is no exposure. Sampling and testing is the best way to know if TCE is present. What are the guideline levels for TCE in air? After a review of the toxicological literature on TCE, the NYSDOH set a guideline of 5 mcg/m3 for TCE in air. This level is lower than the levels that have caused health effects in animals and humans. In setting this level, the NYSDOH also considered the possibility that certain members of the population (infants, children, the elderly, and those with pre-existing health conditions) may be especially sensitive to the effects of TCE. The guideline is not a bright line between air levels that cause health effects and those that do not. The purpose of the guideline is to help guide decisions about the nature of the efforts to reduce TCE exposure. Reasonable and practical actions should be taken to reduce TCE exposure when indoor air levels are above background, even when they are below the guideline of 5 mcg/m3. The urgency to take actions increases as indoor air levels increase, especially when air levels are above the guideline. In all cases, the specific corrective actions to be taken depend on a case-by-case evaluation of the situation. The goal of the recommended actions is to reduce TCE levels in indoor air to as close to background as practical. Should I be concerned about health effects if I am exposed to air levels slightly above the guideline? Below the guideline? The possibility of health effects occurring is low even at air levels slightly above the guideline. In addition, the guideline is based on the assumption that people are continuously exposed to TCE in air all day, every day for as long as a lifetime. This is rarely true for most people who are likely to be exposed for only part of the day and part of their lifetime. How can I limit my exposure to TCE? TCE can get into indoor air through household sources (for example, commercial products that contain TCE), from contaminated drinking water, or by vapor intrusion. As with any indoor air contaminant, removing household sources of TCE will help reduce indoor air levels of the chemical. Maintaining adequate ventilation will also help reduce the indoor air levels of TCE. If TCE is in the indoor air as a result of vapor intrusion, a sub-slab depressurization system, much like a radon mitigation system, will reduce exposures by minimizing the movement of vapors that are beneath a slab into a building.